Questions about the admission or enrollment process? 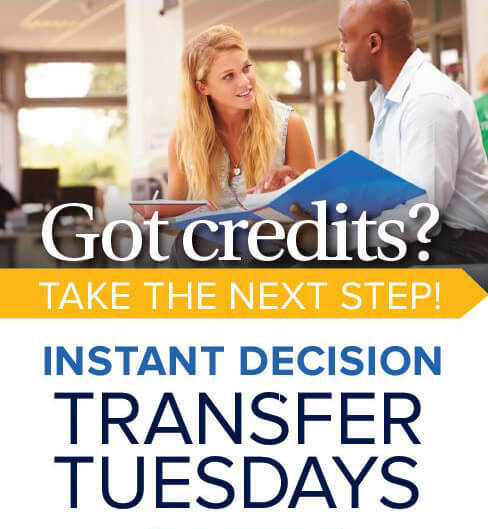 Throughout the year, the Office of Undergraduate Admission will be hosting Instant Decision Tuesdays for students interested in transferring to Monmouth University. Personalized, individual appointments allow potential students and families to meet with an admission counselor to discuss the Monmouth University experience, learn about scholarship opportunities, and determine enrollment options. In order to make your visit as productive as possible, submit your application ahead of time. Also remember to have your official transcript(s) sent. Schedule your appointment today by calling Debbie Seals at 732-263-5380 or send an e-mail to Dseals@monmouth.edu. We look forward to seeing you on campus! Bring transcripts from all colleges/universities attended, and have the official transcripts sent to the Office of Admission Processing, Monmouth University, 400 Cedar Avenue, West Long Branch, NJ 07764. (For nursing applicants only) Bring a copy of your RN license. Visit our Transfer Student Resource Center for more information.